I would like to take a moment to congratulate the project team for successfully completing the Bicycle Master Plan, Pedestrian Plan and the Mitigated Negative Deceleration. Notwithstanding some of the comments from some of the public and a few elected officials at the last City Council Meeting, I’m confident that we conducted the process in a legal, open and transparent manner, and did everything within our power and budgetary constraints to solicit public participation. 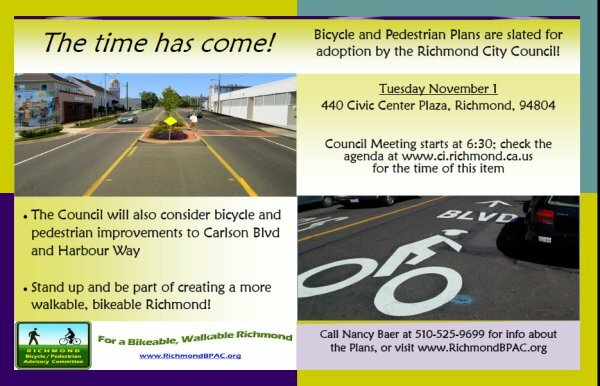 As was stated at the November 1, 2011 City Council meeting, this places Richmond on pace with other neighboring cities that value and encourage bicycle and pedestrian activity and realize the benefits of a robust Bicycle and Pedestrian infrastructure. We’re also excited about the ability to leverage grant funding as a result of having both plans approved. Once again, job well done and the last two and a half years have been a valuable learning experience. Thank you Kieron for making this happen!! What: SAVE THE DATE!!! The Bicycle Master Plan is slated to go to the City Council for adoption. Watch here for an update once the agenda is posted. When: Nov, 1, 2011 Council meeting starts at 6:30. NOTE: Watch the live broadcast on KCRT channel 28 to gauge the speed the agenda is moving along and when this item is likely to begin. Oct 7, 2011 Breaking News The City Manager announced that the Bike Plan is scheduled to go to the city council for approval on Nov. 1st, 2011. Oct, 2011 Click here for the Bicycle Master Plan October., 2011 "final" draft and appendices on the City of Richmond website. Click on the cover (left) to enjoy an enlarged image. If you intend to comment, fill out a pink request and give it to the city clerk (who sits to the far left of the dais) BEFORE item G4 is announced. The city clerk has a pile of blank speaker forms. Copies of the plans and supporting materials are available for public review in the Planning Dept., 2nd floor, Richmond City Hall, 440 Civic Center Plaza, 94804. There are direct links to the plan documents on the navigation bar on the left under "Draft documents"
Comment period for the Bicycle Plan closed on November 19th. 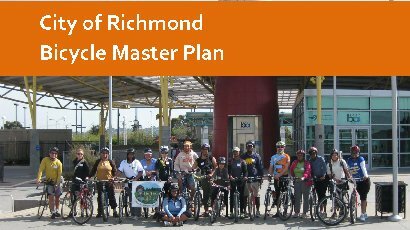 The final draft of the Richmond bike plan is available. 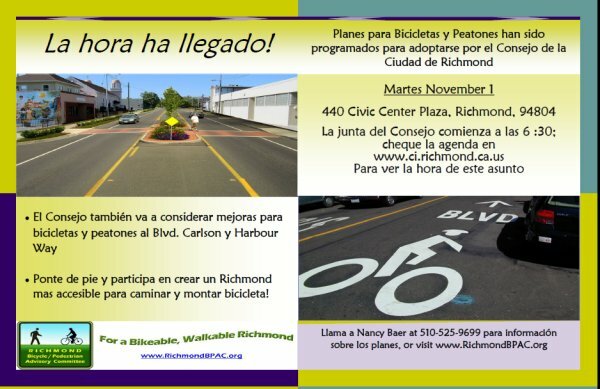 T or on the new City of Richmond bike plan page. In addition, a bound copy of the draft plan is available at the reference desk at the main Richmond Library. Send comments, emendations and corrections by 11/19/2010 to: Kieron Slaughter or directly to us. Add data to the Community Map – an on-line map of Richmond where anyone can add cycling routes, comments and ideas. Contact the Richmond Bicycle and Pedestrian Advisory Committee. Check out the Bicycle Master Plan One-Pager for an overview and to see how you can participate. "HURRAH! For years EBBC has sought to empower a local group of bicyclists who could become the bicycling stakeholders to oversee the planning and implementation of bicycle facilities in Richmond. You have arrived!!"